Two months ago, cannabis stocks, as measured by the 420 Investor Cannabis Stock Index, were down in the dumps. At their trough, the index, which currently has 27 members (based on a minimum price and minimum average daily value traded that were weighted equally at the last quarterly rebalancing on March 31), had declined by more than 20% from the year-end level. Now, the stocks are up more than 13% despite giving up a lot the gains since peaking at up 30.2% YTD on April 18th. That move represented a jump of 63% in just 9 weeks. Life in the market! Cannabis stocks in their short history have a tendency of explosive rallies followed by protracted declines. In early 2013, they doubled very quickly before wiping out the entire rally and then some over the next six months. In early 2014, the index exploded as the doors to the retailers opened in Colorado. Quite simply, too many investors crowded into too few stocks, almost none of which were good deals even when the rally started. The index peaked at 1010, representing a gain of 535% in about 80 days. While the average stock rallied this much, it wasn’t uncommon to see some stocks that rose 2000-3000%. As the number of “cannabis stocks”, which weren’t really cannabis stocks at the time in the sense that many weren’t even real companies and the rest weren’t growing or selling cannabis, exploded, the prices imploded. That 23-month decline to the recent low represented a 97% loss from the peak. The market could rally a lot further and still be in the hole, as it is down even after the recent rally by still 95.6%. 2016 will see a lot of interest in the back part of the year. With Nevada for sure and several other states possibly, including California, having ballot initiatives for outright legalization, traders are anticipating limited downside in front of the election season. Growlife (OTC:PHOT) came back to life. 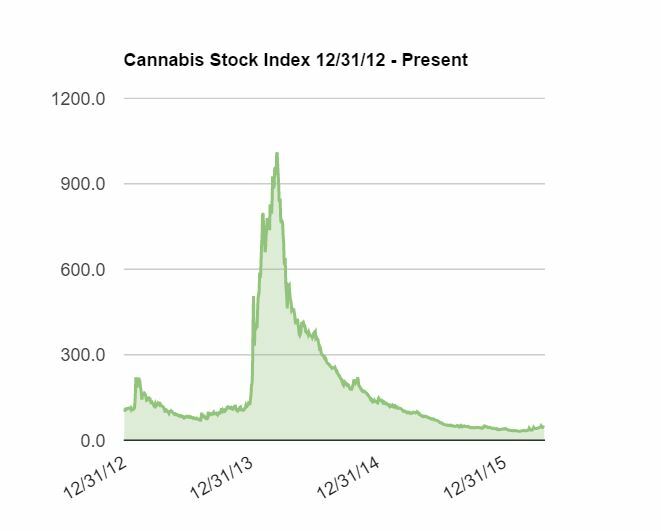 The SEC suspension in 2014 pretty much coincided with the peak and accelerated the collapse of cannabis stocks, as PHOT was widely held and was seen as a leader. The fact that it was able to relist after being relegated to the Grey Market (no bids or offers) was a huge positive surprise and provided a boost to sentiment. This news hit right at the bottom of the market in February. GW Pharmaceuticals (NASDAQ: GWPH) doubled on March 14th when it announced positive results for its Phase 3 clinical trial for Epidiolex, sparking interest in other cannabis biotech stocks, even if not deserved. GWPH is up 21% in 2016 despite the challenges for the overall biotech sector. Terra Tech (OTC: TRTC) rallied early in the year on news it was buying Blum Oakland, but the stock broke out on significant volume on March 18th as the closing date approached. TRTC is similar to PHOT from 2014, with wide ownership and viewed as a leader of the sector and one of the few direct cannabis companies. As of today, the stock is up 420% YTD. MassRoots (OTC: MSRT) reignited hopes for a OTC to NASDAQ uplisting for the sector. 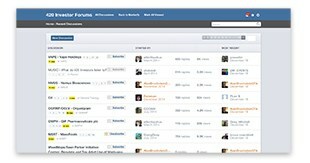 The stock rallied on record volume on the April 11th announcement that it had actually applied. There was some anticipation that the United Nations General Assembly Special Session (4/19-4/21) might yield some positive news (it didn’t). Finally, news that the DEA will consider rescheduling cannabis by mid-year has also attracted traders. So, a confluence of events led to a powerful rally from very depressed levels. Cannabis stocks don’t yet match the fundamentals of the overall industry and are highly speculative, appropriate for traders rather than investors. The technicals have improved dramatically over the past few months, and the DEA rescheduling potential could keep traders engaged for the next two months. While the summers tend to be tough on cannabis stocks, it seems likely that dips could be modest in front of the elections later this year. 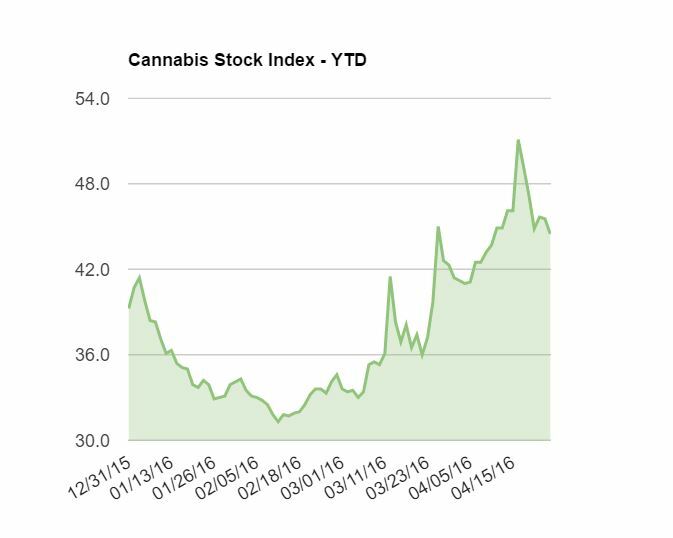 Keep your eyes on the Cannabis Stock Index, which you can bookmark, as it may post its first winning year since 2013.